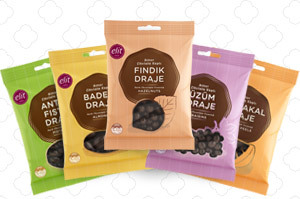 Elit dark chocolate dragee line has been relaunched. The new dragees will lure the chocolate lovers with their new stylishly packages of 100 gr., 110gr and 130 grams. When mixed with our tasty dark chocolate, these Hazelnut, almond, pistachio, orange peel and raisin dragees turn into an undeniably delicious zest festival.